Despite all my deadlines and personal goals sometimes I feel the need to join a group and play. Of course, I always do it with the caveat that it is pretty much a guarantee I will be late in meeting any deadlines. It is the same with any bee, round robin, or group project. That's why I usually volunteer to be the assembler at the end. Plus, that is one of my favourite parts. All that being said, I do enjoy the creative process and challenge of working with other people's work. Sometimes it feels like drawing bodies on heads, sometimes it is tremendously difficult. It is a push to add without detracting, to make use of seemingly disparate things. I may not be able to meet group deadlines very well, but I think I can meet this kind of challenge. I am part of a group, modelled on the Travelling Quilts that you've likely seen out there. Some of us Canadians brought in a few American friends and we're playing. 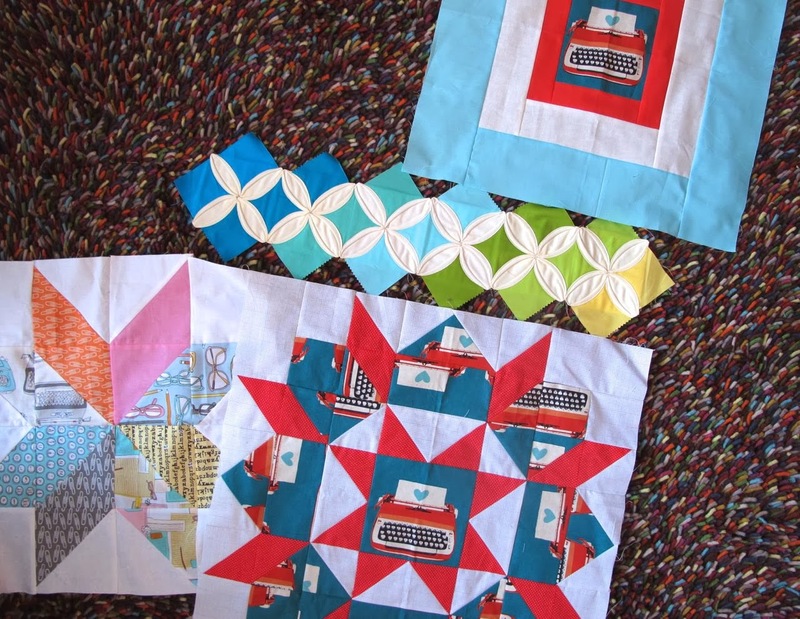 Here are a few of the quilts. This one started with Jenn, of Pinkbrain Quilts. 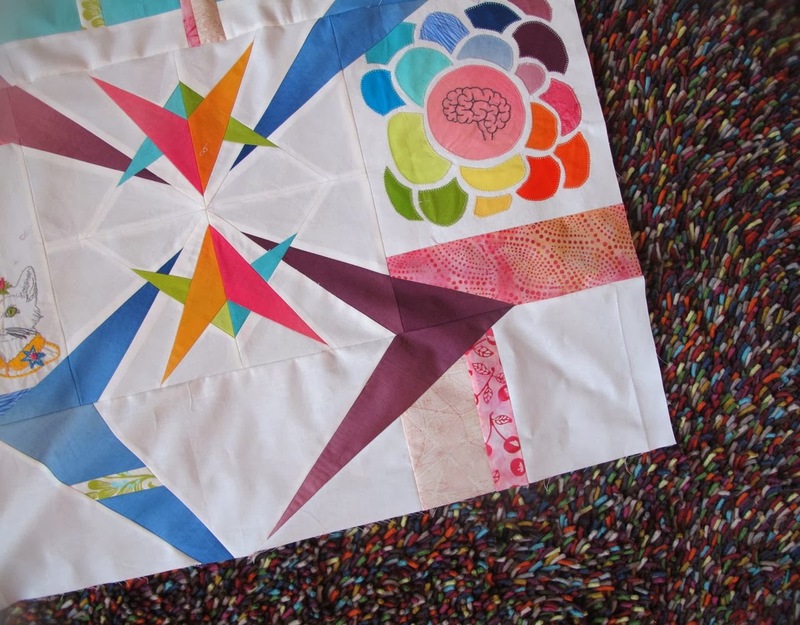 She made the paper pieced non-star block in the centre. Then Julie added some stellar embroidery, including the pink brain! Then off to Jacqueline. She made up a bunch of linear blocks, but didn't join them to the original. My initial thought was more circles - shocker. Then I decided to bring in the linear aspect of Jacqueline's blocks. But those angle from the original are so intriguing. So I extended angles and joined them with the fabric and linear aspects of the additional blocks. Not an easy addition, but so much fun and I love the results. I can't wait to see what happens next! Off to Anna and Robyn next. It's hard to figure out where to go when you start with colour blocked cathedral windows. For me, the temptation was strong to just make more and more. Can you imagine a quilt just like that? These were the beginning of Julie's quilt. Jacqueline made a whole schwack of blocks, many on the large scale like these ones. I took the combination of text inspiration and the cathedral windows and combined them for my blocks. Love the type writer block. Thanks for all the inspiration. omg, there should always be time for playing in the quilt space. My mom is coming to visit this weekend and she is bringing bunch of fabric that needs cutting but hasn't told me what. Am looking forward to what she's up to next. The challenges that these bring can be very inspiring. Good stuff! So pretty! 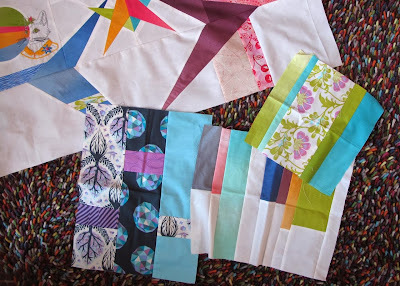 Love how all the diverse styles come together into one beautiful looking quilt! Love the first quilt ~ what is that and can you show a bigger photo? 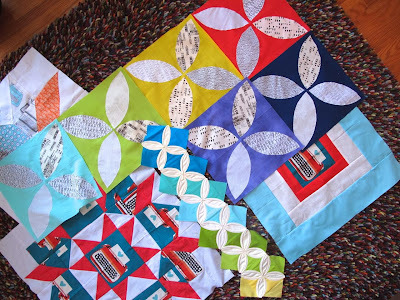 The travelling quilt bees always look like fun but I have not done one yet. The colours and blocks are beautiful. So cool! I never thought of the pumpkin seed shape as being the same as cathedral window, but it is the same!